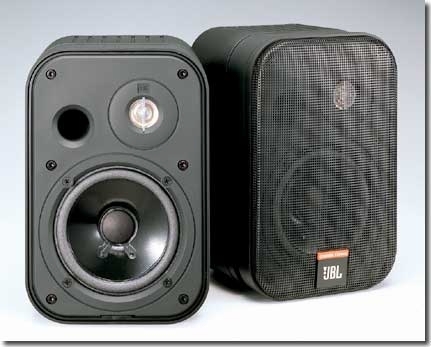 JBL Control 1 Two-Way Compact Speaker DJParts - All Variety of Parts that DJ Needs. The Control 1TM is a high performance personal monitor loudspeaker. Incorporating a 5¼" (135 mm) low frequency loudspeaker, 3/4” (19 mm) high frequency radiator and high performance dividing network, the Control 1 provides full-range, low distortion reproduction in a variety of applications. Compact and durable, the Control 1 performs equally well in recording studios, mobile audio video control rooms and broadcast studios. It is also highly suitable for foreground and. background music use in restaurants, discotheques, and audio-visual applications. HF and LF transducers are magnetically shielded, permitting the Control 1 to be used in close proximity to video monitors. Well balanced sound and exceptional power handling make the Control 1 ideal for any installation requiring professional control monitor performance from a compact source. Control 1 mounting versatility is enhanced by a complete line of installation accessories. SYSTEM: Frequency Response (± 3 dB): 120 Hz to 20 kHz Power Capacity¹: 150 W Sensitivity 2: 87 dB SPL, 1 W, 1 m (3.3 ft) Directivity Factor (Q): 2.8 Directivity Index (DI): 4.5 Nominal Impedance: 4 ohms Crossover Frequency: 6 kHz Polarity: Positive Voltage to + terminal causes outward low frequency cone motion. ACCESSORIES: MTC-1A Wall/Ceiling Mount: This simple unit allows the Control 1 to be mounted to any rigid surface while permitting the speaker to be aimed in almost any direction. Optional Colors. MTC-2 PLUS Wall/Ceiling This more attractive unit allows the Control 1 to be Mount System: mounted to any rigid surface while permitting the speaker to be aimed in almost any direction. Optional Colors. MTC-7 American Microphone This unit allows Control 1 to be mounted on a Stand Adapter: microphone stand with American standard threads. MTC-8 Wall Mount Bracket: Low cost, fixed angle wall mount bracket. Optional 1Rating based on test signal of IEC filtered random noise with a peak-to-average ratio of 6 dB, two hours duration 2Sensitivity is based on a swept 500 Hz to 2.5 kHz signal for an input of 2.0 V @ 4 ohms. Control 1 Miniature Loudspeaker System Wall/ceiling mounting brackets are available for permanent attachment to any rigid surface. A clamp mounting system is available for semi-permanent attachment to a wide variety of structures. Additionally, mounting adaptors are available to interface the Control 1 system to other menu systems now in use as well as photographic tripods or microphone stands. Architectural Specifications: The loudspeaker system shall consist of a 135 mm (5¼ in) lowfrequency transducer, 19 mm (¾ in) dome high-frequency transducer, and frequency dividing network installed in a ported enclosure. The magnetic assemblies shall use ferrite magnets, with integral shielding of the external magnetic field. The low frequency voice coil shall be 25 mm (1 in) in diameter. The frequency dividing network shall have a crossover frequency of 6 kHz and shall utilize polypropylene bypass capacitors to reduce hysteresis effects on the signal. Performance specifications of a typical production unit shall be as follows: measured sensitivity (SPL at 1 m (3.3 ft) with 2.0 V input, swept from 500 Hz to 2.5 kHz) shall be at least 87 dB SPL. Frequency response shall be within plus or minus 3 dB from 120 Hz to 20 kHz. Usable frequency response shall extend downward to 70 Hz. Nominal impedance shall be 4 ohms, Rated power capacity shall be at least 150 watts continuous pink noise, based on a test signal of filtered random noise conforming to international standard IEC 268-5 (pink noise with 12 dB/octave rolloff below 40 Hz and above 5 kHz with a peak-toaverage ratio of 6 dB), two hours duration. The entire enclosure shall be manufactured of molded polypropylene structural foam. Optional mounting brackets shall be available for positioning of the loudspeaker at various angles for both temporary and permanent installations, Overall dimensions shall be no greater than 235 mm (9¼ in) by 159 mm (6¼ in) by 143 mm (5 5/8 in) deep. Finish shall be black or white, with metal grille and rubber end protectors.